Heat oil in a large shallow pan, add the miced beef. Cook, stirring occasionally, until meat is well browned. Add the diced tomatoes along with the liquid, peeled and finely chopped onion, sliced mushrooms, crushed garlic and remaining ingredients. Bring to the boil, stirring. Reduce heat and simmer, uncovered for 60 min or until most of the liquid has evaporated. Turn off the heat & set aside. Melt butter in a medium saucepan, stir in flour. Cook gently, stirring, for 1 minute. Gradually add the milk, stir until sauce boils and thickens. Season with salt, Pepper & nutmeg. Add cheeses and stir till cheeses melt and sauce becomes smooth. Take off the heat and set aside. 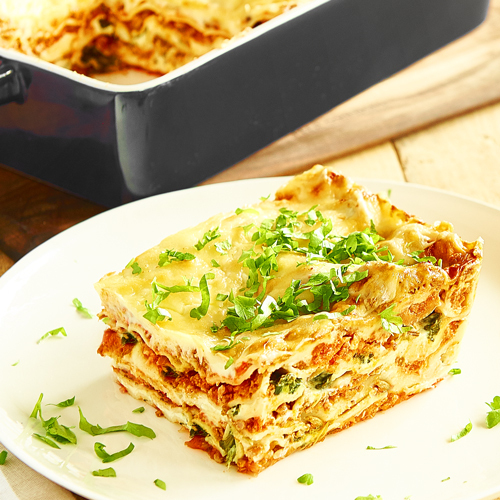 Using a deep Lasagne dish, spread some of the Bolognese sauce at the bottom of the dish to coat the surface, then layer the instant lasagne sheets over the top. Next, place some of the béchamel sauce to coat the pasta sheets and crumble 100g of the ricotta over the sauce along with some of the spinach. Place another layer of lasagna sheets and repeat with the Bolognese sauce and béchamel. Repeat layers by alternating between the béchamel, spinach and ricotta layer, instant lasagna sheets and Bolognese sauce till you are left with a 1cm gap at the top of the dish. Finish your lasagna with a final layer of lasagna sheets, then pour the leftover béchamel sauce over the top, and sprinkle with parmesan cheese. Bake in a preheated oven at 180C for 25 to 30 min until the cheese is melted and golden. Leave to rest for about 5 min before serving.